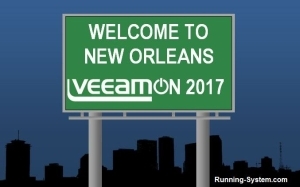 VeeamON is coming to New Orleans, a.k.a “The Big Easy”. A nickname originating in the early 20th century as a reference by musicians to the relative ease of finding work there. From May 16 to 18, 2017 “the Big Easy” of the Data Center Availability market (a big player in the market with an easy to install and manage solution) will hold its flagship conference in town. But let’s take a look at the focus of VeeamON. Veeam writes about their conference: “Welcome to the world’s largest event entirely focused on Availability”. And this sentence is already the answer to the question above: if you want to learn how to ensure Availability and hear all the news about this important topic than VeeamON is definitely the right choice for you. Another reason why you should attend VeemON is networking. The conference is a great chance to connect with fellow IT peers, experts and members of the virtualization community. Especially the latter are a great source to learn from. Whether in interesting discussions at one of the social events or in the vCommunity-driven break-out sessions. And as Veeam is a huge supporter of the vCommunity many of them will be there. So if you attend, you can expect three days full of amazing sessions, certification opportunities, Hands-On labs, demos, networking and LabWarz together with 3.000 other attendees. The event venue is the New Orleans Ernest N. Morial Convention Center, just beside the Mississippi River. Room rates start at about 200$ for nearby hotels (learn more at the VeeamON Housing site). If you are looking for a flight, the next airport is the “Louis Armstrong New Orleans International Airport (MSY). With more than 85 breakout sessions, Hands-on labs and an Expo Lounge where over 50 exhibitors are showing their latest technologies, it will be a challenge planning your days at the conference. If there is still some time left you can test your knowledge of the new Veeam Availability Suite v9.5 in the annual LabWarz. And this pays for itself: besides a lot of fun, more than 25.000 Dollar are waiting for the participants, including a 10.000 Dollar top price! OK, I want to attend. How much is it and where can I register? You can buy the conference pass for the Regular Price of 849 Dollar. Do you want to attend VeeamON for free? Are you an exceptionally gifted presenter and technical expert? Submit your abstract until February 7, 2017 and maybe we see you on stage, presenting one of the break-out sessions. Veeam will pay for your conference pass, travel and hotel accommodations (exception: presenters who are also sponsors). Are you a lucky devil? Well, then take your chance to win one of ten ultimate trips to VeeamON 2017! By the end of the year, Veeam will draw one lucky winner every week to get a full pass, paid stay in a deluxe hotel room and the round-trip to New Orleans! not for free – but for a great price: the Early Bird Ticket! I raffle a full conference pass to VeeamON 2017 here on my blog! Read more here: Win a full pass to VeeamON 2017 in New Orleans! Blog your way to VeeamON 2017! You have a blog focused on technology/virtualization? Great – then take the chance and blog your way to VeeamON 2017! You can win one out of five full conference passes. Plus the chance to be selected as the Most Valuable Blogger for the contest, who will get a conference pass + lodging (three nights!). Read more about this contest here: Blog your way to VeeamON! Take the following quiz to win a fully paid trip (ends March 20th). Prize includes Round Trip flight to New Orleans, a full pass for VeeamON, VMCE Training and stay in a deluxe hotel room! How cool is that??? And here we go: Take the quiz and win your VeeamON experience!!! Check back to this site regularly. I will update the post with news, updates and raffles if available! You missed the Super Early Bird Price! Hurry to get your ticket for the Early Bird Price of 699 Dollar. After that period the Regular Price is 849 Dollar. You missed the Early Bird Price. Tickets are now available for 849 Dollar (Regular Price). added a new raffle to win your ultimate trip to VeeamON in New Orleans! Pingback: Win a full pass to VeeamON 2017 in New Orleans!